The Mexican red knee tarantula originates from the arid scrubland of Panama and Mexico. It has a black abdomen with few red hairs. 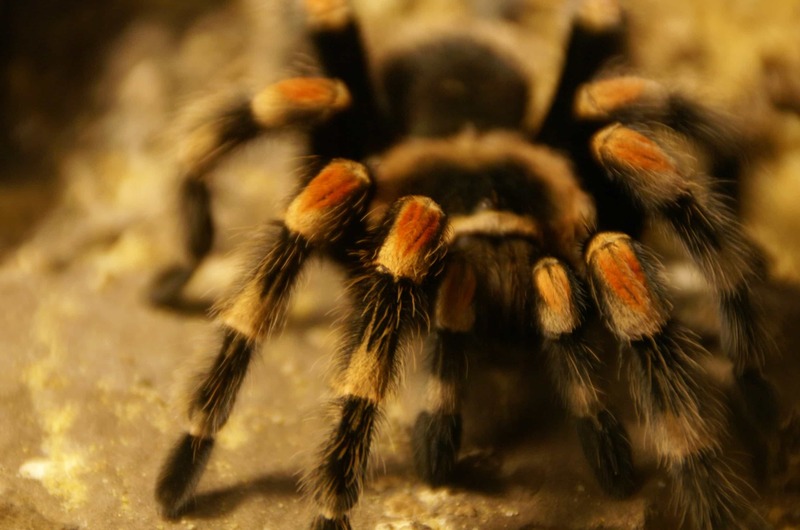 The spider’s legs are also black with bands of red, tan and orange colouration. A fully grown adult spider reach 6-7 cm in body length. The name ‘Red knee’ describes the knee joint which is red and orange in appearance. The Mexican red knee is found on western faces of Sierra Madre del Sur and Sierra Madre Occidental mountain ranges. The Red-kneed Tarantula is a burrowing species living in the deciduous tropical forests in the hilly terrain. The Mexican red knee tarantula will feed aggressively on large insects including crickets, cockroaches, mealworms and locust. The average size tarantula will feed on two crickets per week, with the large ones eating up to six crickets a week. The Mexican redknee grows slowly, maturing relatively late. The female species can live up to 30 years, with the male living an average of five years. Once the male species have matured, it approaches the female shelter cautiously, vibrating and tapping its leg. The female is “lured” out of her shelter where the male lunge forward using its hooks to hold the female chelicerae to push the female upright and access the epigyne. It then injects eggs into the fertilising area. If successful, the male dies after a few weeks. The Mexican redknee is a burrowing tarantula. A captive enclosure should resemble its natural habitat. In a ten-gallon enclosure, line the bottom of the tank with eco-earth. Inside the tank, place a shallow water dish and a hide area. Keep the cage clean by removing the uneaten prey items immediately as decaying matter attracts mould, mites and fungus which could harm the pet. The eco-earth should be damp to enable excavation. 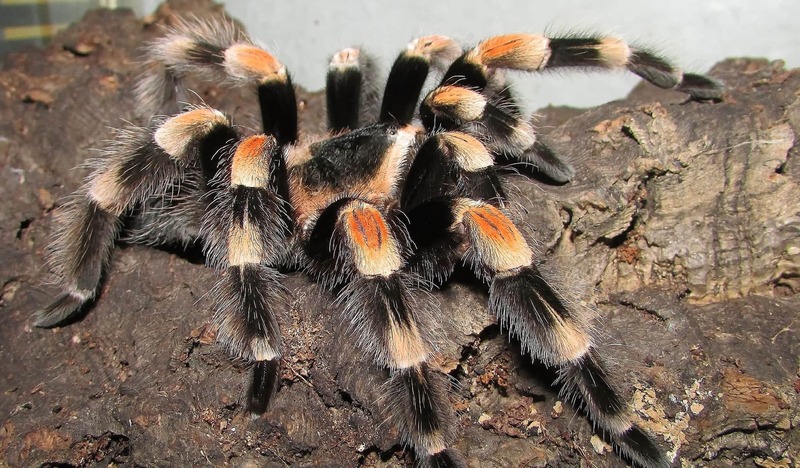 The Mexican red-kneed tarantula scientific name is Brachpelma Smithi. It’s also known as the red-kneed tarantula. The growth rate of spiderlings is described as slow. However, adulthood is accelerated if they are kept in a conducive environment. Generally, Mexican red-knee tarantula development rate is slow wit males taking an average of 5 years to mature and females 7 years. This is common in long-living species. The enclosure temperature should range between 24 and 28 degrees Celsius at daytime and 20 degrees at night time. The environment should remain humid and away from light. 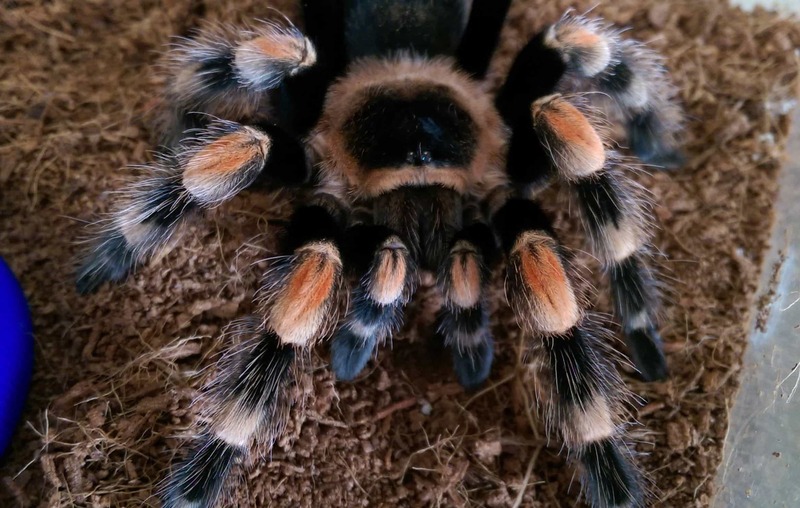 Like a majority of tarantulas, the Mexican red-knee articulate its abdomen and back leg hair if disturbed but make a hasty retreat or simply walk away. The spider venom is slightly venomous to humans causing minor skin irritations and blazing. c after a few weeks. One sac contains more than 250 babies. A mature male can fertilise multiple female eggs. For a successful reproduction, you should reintroduce the male to the female several times.